My friend Tracy Gavant has had a long-career in the shelter magazine industry. Leading the publishing helm at Elle Decor magazine for many years, Tracy honed her design eye well. Now she runs the marketing efforts for Interiors magazine. 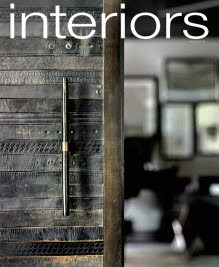 I am a big fan of Interiors, and the magazine stands out in the industry for emphasizing the artisans and craftsmen in design. The magazine puts out beautiful photography as well. You can tell a great deal about a magazine's focus from its cover, and check out the incredible close-up photograph of a door in this month's issue. Tracy has been exposed to much in the way of design, from high-end luxury spaces to country cottages. It comes as no surprise she would have a beautiful and well-designed home herself. I had the opportunity during a rainy day in July to share a lunch in her historic cottage in Amagansett, Long Island. If you are not familiar with the area, Amangansett is the last town in the Hamptons on route 27 heading east, and just before you meander your way east to the tip of Long Island in Montauk. Amagansett still retains the sleepy charm of the "old" Hamptons and refreshingly lacks the hustle and bustle of nearby East Hampton. Tracy excitedly told me how they came upon the house years ago in 1999 while looking to rent for a summer. Even though it was in dire need of repair, they instantly fell in love with the home's "good bones" and the lovely piece of property it was nestled upon. The Gavants knew they could take this historic and simple farmhouse and make it a treasure for their family. profiled on the home just after it was renovated. photograph courtesy of This Old House feature with hydrangeas fully in bloom! It was a pleasure to meander through the home with Tracy, taking in her passion for it all. She pointed out little details such as lowered doorways, a split-barn front door, tucked away porches, the original stone fireplace, and a special reading nook at the top of the stairs. All of these interesting details give the home a unique and cozy feel. Good bones is often a term used in the design industry. There is only so much one can do to improve a space, shy of completely starting all over, so working with a good base is very valuable. During the the renovation they installed a brand new white kitchen, complete with marble counter tops, all Viking appliances and refurbished new wood floors using aged barn wood. "what came first the chicken or the egg"
Dating back to the 1700s, the house was originally one of the outbuildings for the main house, all of which was set on a dairy farm just on the edge of town. At first the Gavant family kept it as is, with various roof lines, a mish-mash of rooms, but over time they took a big leap and embarked upon a complete refurbishment. The renovation was not for the faint of heart, and there was much to consider in regards to construction. With the guidance of local contractor Robert Biondo and architect Erica Broberg Smith, they expanded the 1,500 cottage to a 2,800 square foot cozy weekend retreat, retaining the old world charm of the home yet bringing in modern day appliances and expanding the rooms to spatially make sense for current day living. and character in the East End! board filled with old fashioned memorabilia including local postcards and newspaper clippings.